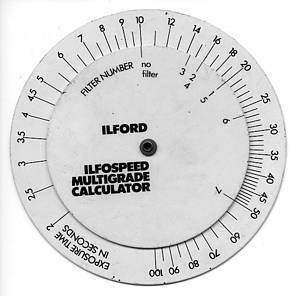 The Ilford Ilfospeed Multigrade II Manual from 1982 (printed in England 82.62.1A.GB) gives useful history relating to Multigrade paper. "The original concept is due to Rudolf Fischer, who patented the idea in 1912, before going on to invent colour development with colour couplers. 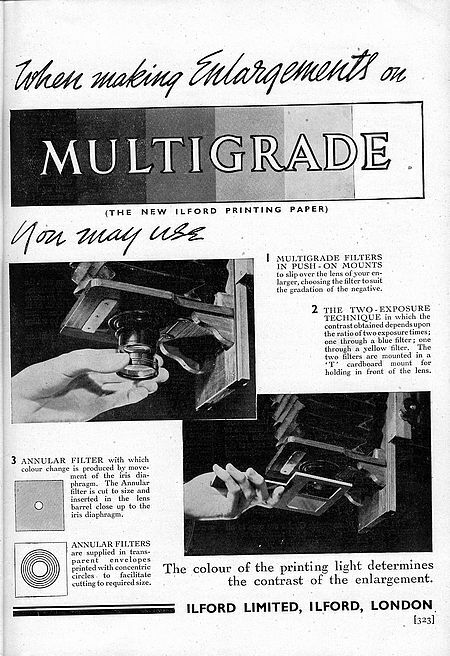 But it was not until 1940, when Ilford launched Multigrade, that the world saw the first commercial realisation of such a product. The revolutionary new material was announced by Frank Forster Renwick in a paper delivered to the Royal Photgraphic Society in May of that year. In his summary, Renwick described Multigrade as having magic qualities in that it would cover almost all variations of the paper grades that had been in common use and would give an endless range of contrasts to suit all kinds of negatives." The text page (below) illustrates Frank Forster Renwick, FCGI, FIC, Hon FRPS, who was born in 1877 and died in 1943. He worked for Ilford, Ltd (initially the Britannia Works Co Ltd) from 1898 to 1922, before spending 3 years with Dupont in the USA. He returned to the UK and became Ilford's Director of Research from 1925. At the time of his 1940 lecture he was Past-President of the Royal Photographic Society and Scientific Director for Ilford, Ltd. It is unfortunate that he didn't live to see the success that Multigrade eventually became. Mr Renwick's paper was delivered on Tuesday 21st May 1940 and was reported in the August edition of the Photographic Journal. Miniature Camera World magazine, in their May 1940 issue, announced the forthcoming presentation by Frank Renwick , thus "On May 21st at 7 p.m. at the Royal Photographic Society's Headquarters, 16, Princes Gate, S.W.7., Mr. F. F. Renwick, F.I.C., F.C.G.I., Hon. F.R.P.S., will introduce "Multigrade", a new Ilford paper, the gradation of which can be adjusted by the use of filters. A demonstration of this new paper will be given by members of the staff of Messrs. Ilford Ltd."
by F F Renwick, F.C.G.I., F.I.C., Hon. F.R.P.S. In introducing the lecture, The President, Mr F J Mortimer, who was in the chair, said that in the early days of The Royal Photographic Society it was a regular thing for the members to give accounts of new processes, but in more recent years new processes had been less in evidence and the demonstration and lectures had been mostly concerned with modifications of existing methods. That evening, however, they were to have the first demonstration of the new printing process called Multigrade. This was practically explained by its title. Many grades of bromide printing papers had been made to meet the requirements of modern negatives, and most manufacturers produced anything up to six grades of each kind of paper. Recently, however, that had been reduced to three, called 'soft', 'normal' and 'contrasty', which dealt with the variations in contrast of most modern negatives. Messrs. Ilford had now come along with an entirely new paper, which had almost magic qualities in that it would cover almost all the variations of grades which they had had, and would give an endless range of contrasts to suit all kinds of negative. Mr Renwick needed no introduction, for he was a Past President of the Society, and as Scientific Director of Ilford was to introduce and describe the subject, which would be followed by a practical demonstration to be given by the staff of Ilford, Limited. Mr. Renwick then read the following paper, illustrated by slides of the apparatus used in conjunction with the new paper. "In past years when I have appeared before this Society I have usually dealt with matters which are of interest to a small minority only of our members, and I am duly grateful for the courtesy which those among my audience who were merely bored invariably displayed on such occasions. To night, on the other hand, I feel that no apology is needed for bringing to your notice a new and somewhat revolutionary type of printing paper, and some simple accessories which have been specially designed to facilitate the making of prints upon it. In the early autumn of 1936 I happened to be studying some tests of an experimental paper in which a sensitising dye was employed, and was rather puzzled by certain peculiarities in its behaviour, until it occurred to me as a possible explanation that part only of the emulsion was colour-sensitive and the rest merely blue sensitive. In order to test this idea I arranged to have made two emulsions of very different types, to colour sensitise only one of them and mix it with the other before coating. When this was done it was found that there was no difficulty in exposing and developing each component of the mixture separately if suitable colour filters were placed in front of the exposing light. In this way the idea for a new kind of development paper took shape in my mind, and our laboratory and factory staffs then proceeded to solve the many problems involved in manufacturing a new product possessing the special characteristics which our knowledge and experience suggested as desirable. I should, however, add that there is more than one way of making a paper of the type to be described, and Ilford Limited, have felt it necessary to obtain patent protection for those methods which we have found to lead to the best results, as well as for certain accessory exposing devices. Multigrade paper is coated with an emulsion, part of which is not colour sensitised, while the remainder is sensitised to the blue-green region of the spectrum. That portion which is sensitised to blue-green light is of a very contrasty character, equalling in this quality the ultra contrasty grades of bromide paper, while the unsensitised portion is rather softer in gradation than a "soft" grade of bromide paper. It would be equally easy to make a paper of the same kind with which blue light gives great contrast and yellow light gives soft results, but there are advantages for the alternative we chose. The best sensitising dyes for our purpose are naturally those possessing the special property of being so strongly held by the grains of the dyed emulsion that they will not wander and sensitise ......."
Frank Forster Renwick, Scientific Director for Ilford Ltd, makes a formal announcement at The Royal Photographic Society. 4 Filters, 1 blue (MG20B) and 3 yellow (MG3, MG7 & MG20). Using no filter gave a soft grade but not as soft as using the blue filter. Multigrade manufacture was discontinued sometime before the end of the war (WW2 ended 1945). Its known that a V-2 Rocket affected Ilford production from February 1945 and this may have caused the temporary halt in Multigrade production. "...minor changes to the filters and to the properties of the paper itself." 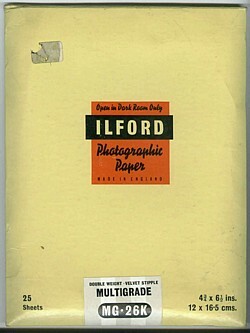 Ilford, Ltd, in the 18th Feb.1953 edition of Amateur Photographer, reported: "Discontinued during the late war (WW2), this very useful paper has now been reintroduced. Costing the same to buy as normal bromide, negatives of all degrees of contrast can be printed on it simply by placing the appropriate filter for the negative in front of the enlarger lens. The principle is that the emulsion has the dual characteristics of rendering a soft image with "white" light, and a hard image with yellow light. A set of three filters of different yellow depth are employed. 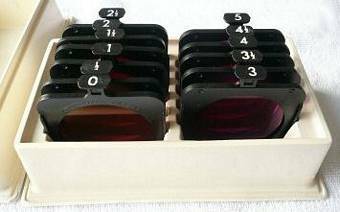 They are of varnished gelatine mounted in cardboard and cost 6s 6d (33p) per set; a filter holder to fasten to the enlarger columns costs 1s 5d (7p). Any intermediate degree of contrast is readily obtained by simply exposing partly with a filter, and partly without; and in the same way, by dodging, different parts of the image can be printed in different degrees of contrast. Development is normal, 2 min at 68°F in ID.20 or PFP being recommended; but a special light brown safelight is required (Ilford No. 902). Two surfaces are available, glossy (single weight and double weight) and velvet stipple (double weight). An illustrated brochure is available for further information. 3 Filters, all yellow (High, Medium, Low). Exposing the paper without use of a filter gave a soft grade. The hardest grade was with the deepest yellow filter. 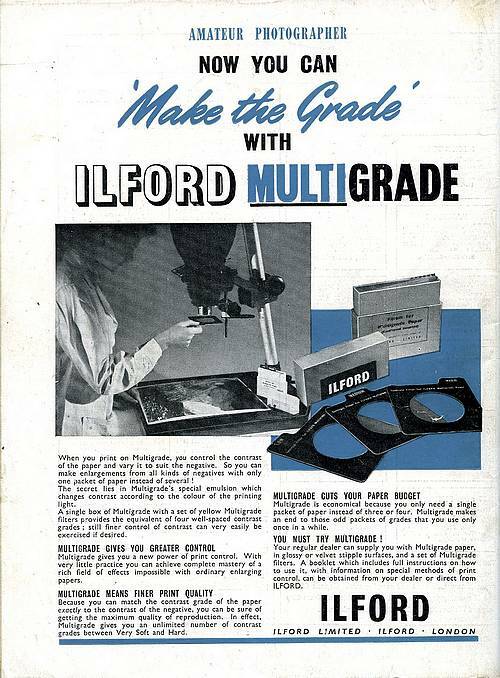 An Ilford advertisement in the June issue of Miniature Camera Magazine (MCM) claims "5 well-spaced grades of contrast in every box of ILFORD Multigrade". Filters were sold in boxes of five, in stiff card mounts, with 2inch filters mounted centrally within the cardboard squares (see 4th generation, below). 5 Filters, marked 1-5, with filters 1 and 2 being magenta coloured (lowest contrast) and filters 3, 4 and 5 being increasing shades of yellow (and increasingly hard contrast). In fact there were 7 Filters available at this time, but intended to be sold as 3 different sets of 5 Filters; one set (Filters 1-5) for enlargers with tungsten filament lamps, one set (Filters 2-6) for contact printers with tungsten filament lamps and one set (Filters 3-7) for enlargers with white cold-cathode lighting. Reintroduced at Photokina in 1978. Ilfospeed Multigrade resin coated (RC) paper. The quality issue had been successfully addressed though the hardest garde available was still not as contrasty as Grade 5 on a single grade paper like Ilfospeed or Ilfobrom. 7 Filters. Deep and pale yellow, then pale through to deep blue, then pale and dark magenta. For the first time the deepest yellow filter gave the softest contrast grade. Multigrade II, although originally planned for release to the market by 1982, was eventually introduced (in the UK, maybe earlier elsewhere ?) near the beginning of 1984. It had the advantages of 11 distinct grades from 0 (extra soft) to a genuine grade 5 (extra hard) with a higher maximum density for deeper blacks. New packaging had a picture on the front. 11 Filters. Filters numbered 0, ½, 1, 1½, 2, 2½, 3, 3½, 4, 4½, 5. Filter 0 is an amber straw colour, with higher contrast filters becoming magenta and blue. 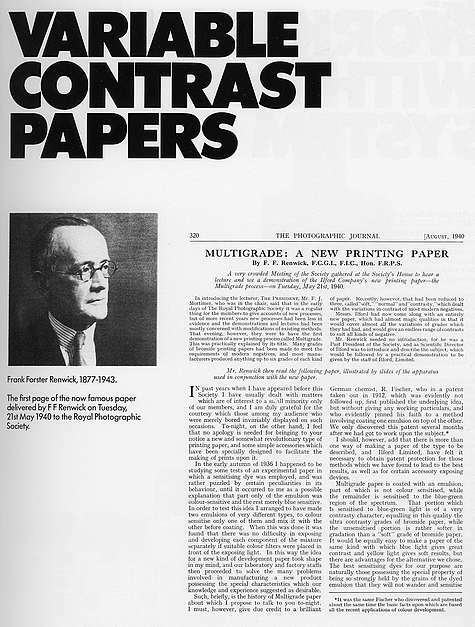 In January 1992, Practical Photography magazine carried out a comparison test of variable contrast papers, finding 7 others apart from Multigrade III and Multigrade FB. These were Kodak Polycontrast III, Agfa Multicontrast, Pal Flexigrade RC & Fibre, Oriental Seagull VC, Tetenal TT Vario and Jessop VC Paper. Download the full test as a pdf file here. Multigrade Xpress with a speed up to 70% higher than standard Multigrade. For the roll photofinishing market and also available in large sheets. Multigrade IV De Luxe incorporated a third emulsion component to control print highlights. Also available is Multigrade IV FB Fibre paper. Awarded the title "European Black & White Product of the Year 1995-96" by the European Imaging and Sound Awards panel of 13 magazine delegates meeting in Geneva. The citation specifically praised its ability to hold highlight and shadow detail simultaneously. 12 Filters now provide 12 contrast grades by the inclusion of an additional Extra Soft grade 00. 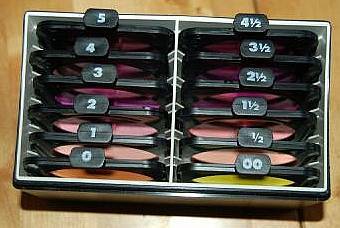 Filters numbered 00, 0, ½, 1, 1½, 2, 2½, 3, 3½, 4, 4½, 5. Filter 00 (yellow) gives the lowest contrast; filter 5 (magenta) gives the highest contrast. Multigrade Warmtone FB (double weight) paper introduced. This fibre base paper produces warm blacks and creamy white tones for luxurious prints. Multigrade RC Cooltone paper intoroduced. The new paper is available in Glossy and Matt surfaces and offers sharper images, improved maximum density and shorter exposure times." The Ilford Photo Press Release says: "the ILFORD Multigrade FB range is further enhanced by the addition of new ILFORD Multigrade FB Cooltone. This new fibre base product gives a cool image colour with crisp whites and well separated mid tones." The current ILFORD Multigrade FB Warmtone remains unchanged. Multigrade IV RC De Luxe; sheets and rolls in coated glossy, satin or pearl surface on an RC base. Multigrade RC Cooltone Glossy or pearl sheets on an RC base. Multigrade RC Warmtone Glossy or pearl sheets on an RC base. Multigrade IV RC Portfolio Glossy or pearl sheets on an RC base. Multigrade IV RC Express Glossy or pearl sheets and rolls on an RC base. According to an article in the Q&A section of Black & White Photography magazine, No.1 April/May 2001, p88, modern variable contrast paper is sensitised mainly to green and blue light. - the green sensitive layer producing lower contrast (soft) images, while the blue sensitive layer produces higher contrast (hard) images. The filters control how much green and blue light reaches the printing paper and therefore the contrast of the finished print. Subsequent to the announcement of Multigrade by Frank Renwick, three detailed review articles appeared in Miniature Camera World magazine's June and September 1940 issues, going into considerable detail of the properties of the new Multigrade paper. Ilford inserted two full page advertisements in the magazine around that time. To view and read originals of all this documentation as a single pdf file, click here. The advertisements are shown (at reduced size) above. Originally there were 4 filters, a M.G.20B (B=blue), and three yellow filters, named the M.G.3, the M.G.7 and the M.G.20 (the last being the deepest yellow and giving the greatest contrast). My thanks to Doug McKee for his assistance with the following information relating to the earlier Multigrade. In the BJPA for 1941, there is an Ilford advert (p69) and a Technical Review (p185) which describes the newly marketed Multigrade paper. "Multigrade is coated with an emulsion, part of which is not colour sensitised, while the remainder is sensitised to the blue-green region of the spectrum. This latter portion has ultra-contrasty characteristics, while the non-colour sensitive part is an emulsion even softer in character than a 'soft' grade of bromide. The result is that when a yellow filter is used in printing, which cuts out the blue light to which the 'soft' emulsion is sensitive, but passes sufficient blue-green to expose the ultra-contrasty emulsion, very contrasty results are obtained; while with no filter, or a blue filter, soft and extremely soft results are produced, respectively." Later the review says "Multigrade is available in glossy and velvet single weight; and silika white, silika cream and cream matt, double weight." 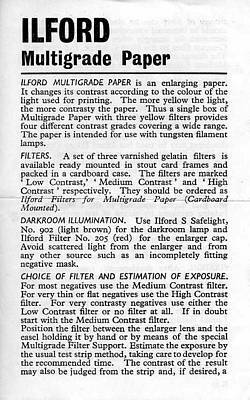 Quoting from p189 of the 1941 BJPA, which describes two novel contact printing boxes bought out by Ilford to supplement their Multigrade paper (see full text below), the original filter set consisted of four filters, "a fairly deep blue (M.G.20B), and three different densities of yellow (M.G.3, M.G.7 and M.G.20). There are actually five degrees of contrast available. The paper itself, with no filter at all...., gives a contrast equivalent to a soft grade. With the blue filter, the contrast is yet softer, the equivalent to a very soft paper. The three yellow filters, on the other hand, give three degrees of increasing contrast - normal to vigorous, contrasty, and ultra-contrasty." 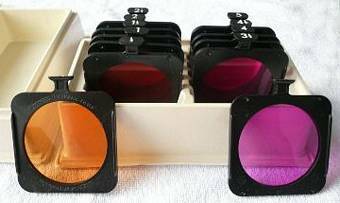 Glass filters in slip-on metal mountsof good optical quality, for use with enlargers, in sizes to order. Glass lamp filtersto fit Multigrade Printing Box No. 1 and available to order to fit contact printing boxes, printing frames, etc. Gelatin filmavailable in special rectangular cardboard mounts, or may be supplied unmounted cut to any required size. "MULTIGRADE" CONTACT PRINTING BOX No. 1. For contact printing with "Multigrade", Ilford Limited have introduced two printing boxes, Nos.1 and 2. No.1 represents a highly efficient, but perfectly simple, light box with incorporated filter holder, and set of four filters, which may be used alternately. The box itself is four inches square and eight inches high, is white painted inside, and takes a standard 40-watt lamp. A small stand is provided for the printing frame, which is set up at a suitable distance, most conveniently about twelve to eighteen inches away, when with negatives of ordinary quality the exposure is of the order of a few seconds only. The fiters are a fairly deep blue (M.G. 20B), and three different densities of yellow (M.G. 3, M.G. 7 and M.G. 20). There are actually five degrees of contrast available. The paper itself, with no filter at all in front of the lamp, gives a contrast equivalent to a soft grade. With the blue filter the contrast is yet softer, the equivalent of a very soft paper. The three yellow filters, on the other hand, give three degrees of increasing contrastnormal to vigorous, contrasty, and ultra-contrasty. The price of this printing box, including filters and printing frame stand (but without the 40-watt electric bulb) is £1 7s. 6d. 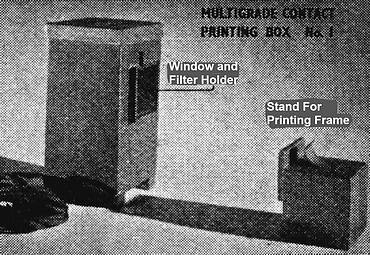 "MULTIGRADE" CONTACT PRINTING BOX No. 2. In Ilford No.2 " Multigrade " Printer (Prov. Pat. No. 24,614/39) the two coloured lights, yellow and blue, for contrasty and soft results, are thoroughly mixed before reaching the negative, and the proportions of the two colours may be controlled with the greatest exactitude. This is effected by a lever on the side of the box, set over a scale to the degree of contrast requiredthe possible degrees corresponding to negative density ranges from 0.8 to 2.2. In operation the printing frame is simply stood against the front glass, where it is registered in the correct position by the clips provided. The size of the aperture is 4½ x 6 in., to print up to half-plate size. The finish of this ingenious printer is similar to that of the smaller boxan excellent bronze-brown enamel. Tests in our darkroom confirmed its efficiency, and showed that the exposure times are of the order of five seconds for a moderate good-quality negative. To work with such a box, and with "Multigrade" in the printing frame, gives a sense of confidence hitherto unknown in contact printing, and we cannot imagine any purchaser ever regretting the outlay. The price of the printer complete and ready for use is £3 0s. 0d. The upper part of the curved scale reads "Harder Negatives or Softer Prints" while the lower part of the curved scale reads "Softer Negatives or Harder Prints". By the end of 1942 (in time to appear in the BJPA for 1943 - p163), the filters (and possibly the paper chemistry) had been revised to the set as shown below "the marketing of a most convenient, serviceable and inexpensive set of five filters...generous 2.5" filter discs, each mounted in a stout square black card, 4" square letterd very boldly in white..." The price complete was 5/- (25p). 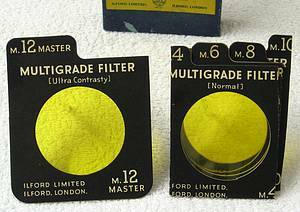 The revised filters consisted of 5 gelatine carboard mounted filters in a box, all coloured yellow. They are named as 4=Normal, 6=Vigorous, 8=Contrasty, 10=Extra Contrasty and 12=Ultra Contrasty. The No.12 filter is also named 'Master'. The filter 12 Master is still at its original size of 4" (102mm) width, while the remaining filters have been reduced in width by some previous owner to 3.25" wide (82.5mm). Presumably this enabled them to fit into the owner's 'below-the-lens' filter holder of his enlarger. Its possible that the No.12 Master was never used. Interestingly, the box of 5 filters is wide enough to hold two more filters, but the space is occupied by two pieces of corrugated cardboard. These card pieces are believed to be original and inserted as 'packing pieces' to enable the box width to be adequate to stand securely upright and make the filters conveniently accessible by pulling them individually from the box using their numbered tabs. The original Multigrade paper, which used the filters described and illustrated above and below, was discontinued by 1945. The Ilford Manual of Photography (revised August 1950; pages 279-284) describes the two methods of use of this second Multigrade filter set and explains the use of the No.12 Master filter. The full text follows these illustrations. The Ilford 'paddle steamer' logo on the filter box, corresponding to pre-1945. Among the several important factors which are involved in the production of a satisfactory photograph is the control of contrast, both in the negative and in the subsequent positive print. So far as negative materials are concerned, it is possible to vary the contrast over a wide range by alteration of development time and by changes in the character and composition of the developer. With positive printing papers, on the other hand, development can be varied only within narrow limits; in general, emulsions of this kind must be developed right out. At one time, printing papers were manufactured in one contrast only, and it was the standard practice to control the gradation of each negative by individual development in order to produce a satisfactory print from the paper available. The introduction of roll films, however, made this method of working impossible and led to the manufacture of papers in several contrasts. In recent years, the rapid growth in popularity of the miniature camera, resulting in the development by the time and temperature method of as many as thirty-six exposures on one length of film has added still further to the difficulty of matching the paper to the gradation of each individual negative, and has resulted in the marketing of bromide papers by some manufacturers in as many as seven different contrasts. The employment of so many grades has the disadvantage that stocks must be kept of contrasts which will seldom be used and, owing to the demand for a wide variety of surfaces, is particularly unsatisfactory because it is possible to supply only the more popular surfaces in all degrees of contrast. The search for a method by which the contrast of the print can be controlled as readily as that of the negative has led to the introduction of Multigrade, an Ilford development paper from which any desired contrast may be obtained by varying the colour of the printing light. It is now possible, with one grade of paper only, to produce perfect prints from negatives of any contrastMultigrade does the work of all the grades comprised in the entire range of bromide paperssoft, normal, hard, extra hard and ultra hard, and is, moreover, capable of an exceedingly fine degree of control. These advantages are further enhanced by the fact that the methods of control apply equally to all the surfaces in which Multigrade is supplied. How Multigrade Works. In order to understand how variation in the colour of the printing light brings about change of contrast, it will be necessary to discuss briefly the method by which Multigrade is manufactured. The paper is coated with an emulsion, part of which is not colour sensitized, while the remainder is sensitized to the blue-green region of the spectrum. The portion which is sensitized to blue-green light is of a very contrasty character, equalling in this quality the ultra-hard grades of bromide paper, while the non-colour sensitized portion is softer in gradation than the softest grade of bromide paper. Thus, it is only necessary to regulate the relative extent to which each of these two components is affected during exposure to modify the gradation of the resultant print to any desired value between the extreme characteristic of each component. The balance between the two components is so adjusted that for exposures to the unfiltered light of an incandescent tungsten lamp, the greater proportion of the image is formed on the extra soft element with the result that, when used in this way, Multigrade acts like a very soft bromide paper. It is clear, therefore, that removal from the exposing light of part of the blue-violet radiation to which the non-colour sensitized component responds, will result in the formation of more of the image on the colour-sensitized and contrasty component, and that the increase in contrast produced in this way will depend on the extent of the blue-violet deficiency. Control of the blue-violet content of the printing light is most conveniently brought about by means of colour filters. 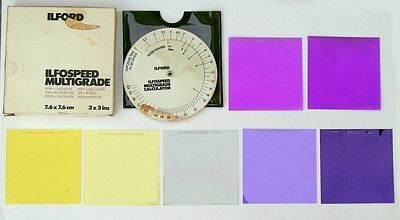 Those who are already familiar with the use of colour filters on the camera are, of course, aware that violet and blue absorbers are yellow in colour, and a special series of five yellow Multigrade filters has been produced by Ilford Limited. These are graduated in strength from very pale yellow to deep yellow, and provide a range which, starting from the palest, applies a definite and increasing amount of blueviolet absorption until on reaching the strongest filter sufficient of the short wavelength radiation is absorbed to leave the soft component of the emulsion entirely unaffected during exposure. Thus, with the aid of the five filters, it is possible to produce a series of five contrasts, from soft to ultra-hard. The use of the five yellow filters provides the basis of the first of the methods of handling Multigrade which will now be described. All that the user has to do in applying this method is to examine the negative to be printed, decide from its density range which bromide contrast would normally be required, and then carry out the exposure on Multigrade paper with the aid of the appropriate filter as indicated by the table. Negatives adapted for printing on Multigrade with the different filters will be of different density ranges, but if these ranges all start from a common low level of density in the shadow region of the subject, the user will find that roughly the same printing exposure is required whichever filter has to be used. Thus, the user can estimate what exposure to use by examining the shadow densities of his negative. If these vary from one negative to another the exposure necessary to yield the best print with the chosen filter may be found in the usual manner by means of test prints or test strips. Second Method.This method will have a special appeal to many, especially after some experience with Multigrade, since by the employment of a relatively simple technique it permits the most delicate adjustment of contrast and requires the use of only one filter, the Ml2 (Master). of the total exposure into ten units is quite sufficient for normal purposes. On this basis, exposures may be made up with ten units of white light and none of yellow, nine units of white and one of yellow, eight units of white and two of yellow, and so on. As an approximate guide to the range of contrasts thus produced, the following table will be found extremely useful. The practical procedure with this method is in reality very simple, although on paper, at least, the calculation of the necessary exposure may appear a little complicated. It is first of all necessary to make a test print without filter in order to determine the time required to print the middle tones of the negative to the correct depth. This provides a basis on which to calculate the subsequent mixed light exposure, and in conjunction with a careful examination of the negative, the print may be used to judge which bromide paper contrast would best suit the subject. (The test print from a negative of good range and average contrast will normally be softer than is finally needed, having too much density in the highlights and too little in the shadows.) Reference to the above table will then show the correct proportions of white and yellow light to use in making the Multigrade print and the printing time as determined by the test exposure is subdivided accordingly. At this point, allowance must be made for the light absorption of the master filter, which has an exposure factor of 4, and it is necessary, therefore, to multiply the calculated yellow light portion of the exposure by this amount. A very little practice will soon make it a simple matter to decide upon the correct proportions of white and yellow light required for each negative. Test exposure without filter = 20 seconds. Hard bromide paper = Contrast factors of 3 (white) and 7 (yellow). Three-tenths of 20secs = 6secs (white light portion). Seven-tenths of 20secs = 14secs (yellow light portion). White light 6 seconds. Yellow light 14 x 4 = 56 seconds. Quality of Negatives for Multigrade Printing. Multigrade paper makes it possible to obtain perfect prints from such a wide variety of negatives that it is well to remember here, as with other printing processes, that the negative, whatever its gradation, must include within its density range all the tone values which are intended to be recorded in the final print. No printing paper can be expected to possess the magic power of discovering subtle tone differences which are absent from the negative, nor can it reproduce interesting shadow details from areas of film entirely clear through under-exposure. In order that exposures through the filters may be kept reasonably short, it is advisable that negatives for enlargement should not be unduly dense, and it is important that they should be free from chemical stain which, because of its colour, can exercise a disturbing influence over the control of gradation. Darkroom Lighting. Since a portion of the Multigrade emulsion is colour-sensitized, the importance of correct darkroom lighting cannot be over-emphasized. Many of the safelights used for handling bromide paper are most definitely unsafe with Multigrade, and much annoyance and disappointment will be avoided, therefore, if the darkroom lamp is fitted with the recommended safelight, an Ilford "S" Safelight No. 902 and a bulb of power not exceeding 15 watts. In the same way certain enlarger safety caps are unsuitable for Multigrade, but here again a safety cap containing the Ilford " S" Safelight is satisfactory when used with care. Processing. Apart from the unique method by which the gradation of Multigrade prints is controlled, the paper is handled in exactly the same manner as an ordinary bromide paper and has the same general characteristics. It may be developed in any normal M.Q. or Amidol formula, but the standard Ilford ID-20 formula, which yields prints of a fine neutral black colour irrespective of the colour of the printing light, is particularly recommended, the correct time of development being l½-2 minutes at 65°F. (18°C). One point of difference from bromide papers should, however, be noted. Whereas with bromide papers the shadows build up towards the end of development, the reverse occurs in the case of Multigrade, where the shadows build up at an early stage of development and highlight detail appears last. After development the prints should be rinsed and placed in an acid fixing bath as for bromide paper. After-treatment of Prints. Multigrade responds particularly well to toning, and gives a fine sepia by the sulphide method. By using both the white and cream base varieties, a wide range of image colours can be produced. Contact Printing. Either of the methods already described for use with enlargers may be employed for contact printing, and in order to simplify the application of either of these, a special unit, called the Multigrade Printing Box No. 1, has been produced by Ilford Limited. It consists of a lamphouse fitted on one side with a small window into which any of the Multigrade filters, in the form of lamp-filters, can be inserted. A second and more elaborate device to assist the contact printer is the Multigrade Printing Box No. 2. 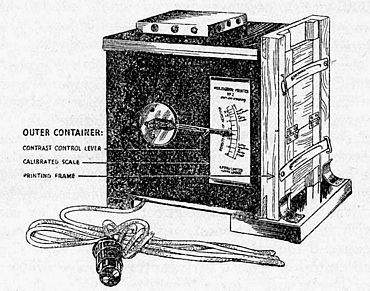 This is a light-integrating apparatus in which the required proportions of the printing lights are thoroughly mixed before emerging from the outer opal window against which the printing frame is placed. The light mixture is controlled by means of an external lever which moves over a graduated scale indicating the degrees of contrast which will be obtained at a number of settings throughout the range. The above early version of Multigrade was withdrawn during World War 2 (before 1945). It is believed to have failed to provide the image quality of conventional papers. It was re-introduced in May 1953. Using 'below the lens' filters on an Envoy enlarger. Multigrade manufacture was restarted in Spring 1953 (ref: 'Photography' magazine) with some 'minor' (see BJPA for 1954, p191) changes to the filters and the paper itself. The revised Multigrade was advertised on the back page of Amateur Photographer magazine for 1st April 1953, see left. The picture below shows the three 'beneath the enlarger lens' cardbpoard mounted Contrast Filters for ILFORD Multigrade Paper. To the extreme left is the 'High' contrast filter (the deepest yellow); in the middle is the 'Medium' (a less deep yellow) and to the right is the 'Low' contrast filter (pale yellow). The box is marked 8s/7d (43p) which probably represents their cost when new. In 1953 a filter set cost 6s/6d (33p) and by 1955 (?) they were priced at 9s (45p). 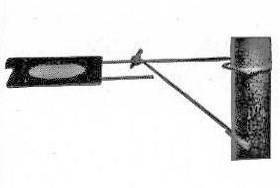 An accessory sold at the time of the 3-filter set was a wire filter support, for fitting to the enlarger column, with 'arms' for holding the filter beneath the enlarger lens. It was priced at 2s.7d (13p) in 1955(?) and 1s 11d (10p) in 1953. 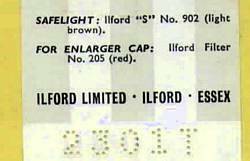 An Ilford booklet ('Ilford for faces & places', believed to date to 1955), says that the filters "mounted in suitable 'holding' cards so that the filters need not be finger-marked" were available either as three filter sets or supplied individually. A 1953 version of the same booklet makes no mention of filters being sold individually. Referring to the Amateur Photographer full page Multigrade advert above, Paul Godfrey comments: "The man who taught me everything; Peter Notley ARPS AIBP, had one of these enlargers (an Envoy); also, John Wells of Lowestoft, where I had my first real job, had one. Paul has sent me two Multigrade leaflets. The first of these (click here to view it as a pdf) dates to December 1954, when there were just the 3 filters, as above, though a fourth option was to use no filter, obtaining a very 'flat' print, but suitable for obtaining good print contrast from a high contrast negative. This leaflet also advises that maximum print contrast could be obtained by using the High Contrast Filter in conjunction with giving a full printing exposure, followed by curtailed print development (the opposite of normal practice). The converse could also be applied with contrasty negatives. The leaflet alongside probably originated as an enclosure within a pack of Multigrade paper, sold at the time of the 3-filter set and dated November 1953. 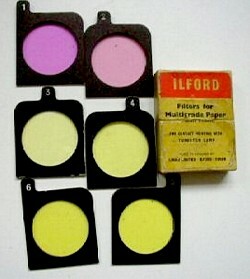 By late 1959, Multigrade used 5 filters, marked 1-5, with filters 1 and 2 being magenta coloured (lowest contrast) and filters 3, 4 and 5 being increasing shades of yellow (see lower left). These filters were smaller than previous, in mounts around 2.5" (63mm) square. 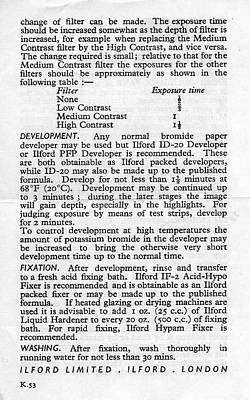 The transition to 5 filters seems to have taken place without any major 'fanfare'; the only clue is in an Ilford advertisement within the 1962 BJPA, where "5 contrast grades in each sheet" is a claim mentioned for the first time. The lack of any 'fanfare' suggests there was no great change to the materials, and curiously the depth of yellow colours in the 3-filter set do seem to match (by eye) the filters 3, 4 and 5 in the 5-filter set. If Multigrade paper was unchanged, therefore, it seems that the only gain by a user was in obtaining even softer grade prints (using the new magenta Filters No.1 & No.2) than had been obtainable hitherto. But perhaps the paper was made intrinsically 'harder' at this time, such that some gain was obtained at both ends of the contrast range. I used Multigrade in the early 1960s and owned a set of 5 filters as illustrated (extreme upper left), but was disappointed with image quality compared to using a single contrast Kodak paper (usually a glossy 'hard' grade, as I liked 'punchy' prints). The second PDF file leaflet from Paul Godfrey applies to the 5-filter stage of Multigrade, dating from November 1959. The 25 sheet pack of 4¾"x6½" (12x16.5cm) double weight velvet stipple Multigrade paper, shown above, most probably dates from post-July 1962, as the instruction leaflet (above) carries the footnote G.62. "there were SEVEN filters, ranging from magenta through pale yellow to the strongest yellow. The filters were arranged in THREE sets of FIVE to give one set for enlargers with tungsten filament lamps, one set for contact printers with tungsten filament lamps and one set for enlargers with a cold cathode light source. White cold cathode enlargers were OK with Multigrade but Blue cold cathode were not (cold cathode was a technology to use fluorescent lamps in enlargers)". Based upon this information, it seems unlikely that the 1960s 5-filter set ever acquired a 6th filter, despite the curiosity of a 6th filter in the set in the picture, left above, taken from an ebay auction. 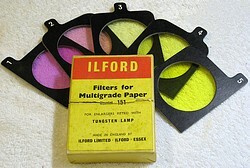 Since all available Ilford literature refers only to FIVE filters making up a single set, it is believed more likely that the illustrated 6-filter set is merely a standard 5-filter set with the addition of Filter No.6 taken from the extended range that Ilford provided in order to cater for three different printing light sources. Possibly the 6-filter set was, therefore, either an attempt by the owner to obtain additional contrast by acquring a deeper yellow filter than was in his standard set or perhaps he used the filters with two different light sources. Filter No.1. would require 9secs, Filter No.2 would require 9.5secs, Filter No.4 would require 12.5secs and Filter No.5 woulod require 14secs. 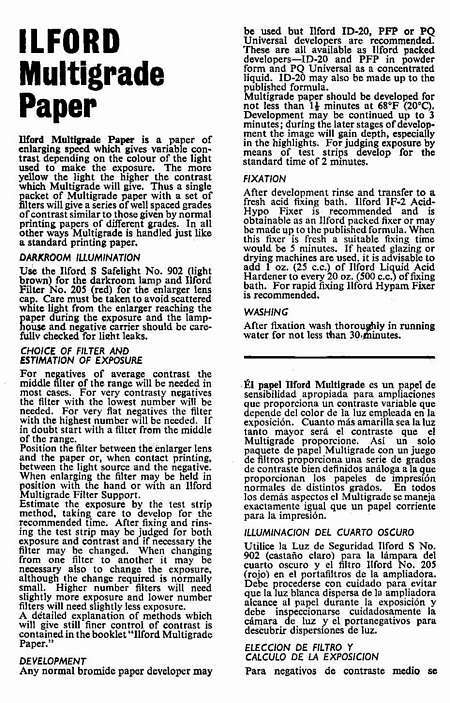 This version of Multigrade Paper was discontinued from 14th April 1969 (ref: Photography magazine, May1969, News Desk), "So as to (enable Ilford) better ....to meet the continually increasing demand for Ilfobrom paper..." (introduced in 1967). 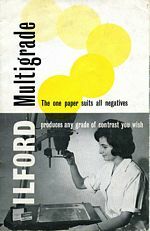 An Ilford Multigrade booklet, describing all of the above and making recommendations for its use, can be downloaded by clicking on the image alongside or here. It is 'dated' D64 = April 1964. Interestingly, the booklet doesn't illustrate the magemnta filters 1 and 2, only the yellow filters 3 to 7. This may have been to reduce the cost of booklet printing, as the only colour used in the booklet is yellow, apart from moncochrome grey. An AP advert by F.E.Jones of Liverpool (AP, p70, 31Dec1969) offered remnant Multigrade paper being sold off cheaply and with "Filters No. 1 to 7 FREE with each order". Multigrade was reintroduced in 1978. The quality issue had been successfully addressed such that Multigrade eventually (as now) came to be used by most all photographers involved in black & white printing. 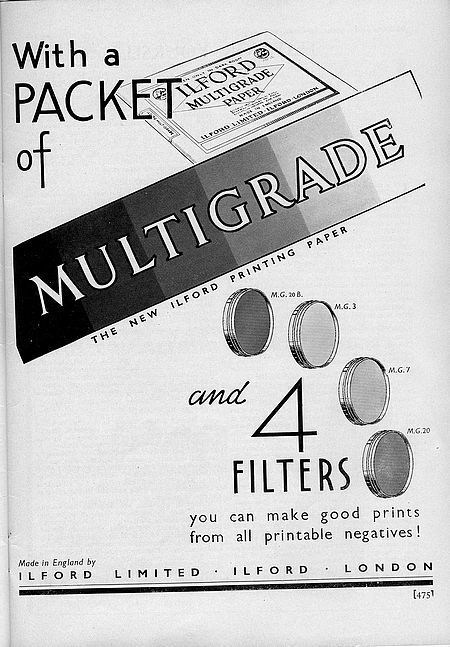 Shortly before Multigrade II was announced, the filters were improved to reduce the duration of printing exposure. The darkest yellow filter, lower left, is Filter 1 (the softest grade) while the top right hand filter is Filter 7 (the hardest - but still not as contrasty as Grade 5 on a single grade paper like Ilfospeed or Ilfobrom). with Filter 7 the exposure = 50 secs. Not easy to work out in the darkroom without a calculator ! Although originally planned for release to the market by 1982, Multigrade II was eventually introduced (in the UK, maybe earlier elsewhere ?) near the beginning of 1984. This paper gave the advantages of 11 distinct grades from 0 (extra soft) to a genuine grade 5 (extra hard) and also easier exposure control by virtue of the paper speed remaining constant from grade 0 to 3.5 and requiring just a doubling of the exposure for grades 4 to 5. Image quality at last equalled the best of uni-grade papers. The previous Multigrade filters could still be used but with the disadvantage of more variable exposure times when changing between filters. Multigrade RC (Resin-Coated) III DeLuxe was available in February 1990, with improved base whiteness and a higher contrast on grade 5. (Ref: Practical Photography, Ilford advert, p18-19). Also available as Multigrade FB (fibre base) glossy single weight and as glossy, matt and stipple double weight. At Photokina (September) in 1990, Multigrade Xpress was launched, with a speed up to 70% higher than standard Multigrade. It was aimed at the roll photofinishing market and was also available in large sheets. The two filters shown out of their 11 filter set box are (LHS) Filter 0 (soft grade) and (RHS) Filter 3 (medium hard grade). Apart from filters in plastic mounts (as shown), they were also available unmounted as 3.5" and 6" squares. Further improvements lead to Multigrade IV De Luxe paper appearing at Photokina in 1994. It incorporated a third emulsion component to control print highlights. Marketed as the first paper to 'think like a printer', stressing easier printing, greater exposure latitude and an enhanced tonal range. The base became slightly colder in colour, and heavier in weight. Multigrade IV is still (2008) current. Also available is Multigrade IV FB Fibre paper. With the introduction of Multigrade IV, the filter range was extended to 12 grades by the inclusion of an additional Extra Soft grade 00. Exposure times remain constant (using Multigrade filters) over the 8 grade steps from 00 to 3, with a doubling needed for grades 3.5, 4, 4.5 & 5. An advertisement in Amateur Photographer, 6th July 1996, by the company 'Capitol sound & vision' shows Multigrade IV, glossy or pearl, 25 sheet packs of 10"x8" at £8.25, 100 sheet packs at £26.85 and 10 sheet packs of 12"x16" at £8.65. The Ilford Photo Press Release says: "For 20 years, the best selling ILFORD Multigrade IV FB paper has been the product of choice for creative photographers the world over. Following extensive R&D, significant improvements have been made. Now replaced by the renamed ILFORD Multigrade FB CLASSIC. The new paper is available in Glossy and Matt surfaces and offers sharper images, improved maximum density and shorter exposure times." Kodak's equivalent multi-grade papers are no longer available. Production of Polycontrast IV RC, was ended, together with all Kodak's black & white papers, in mid-June 2005. (Kodak first started selling variable contrast paper, at least in the USA, with two materials, called Polycontrast and Polycontrast Rapid, in Autumn 1957; Ref: Photoguide Magazine, September 1957). Polycontrast III was one of 9 different variable contrast papers from 7 manufacturers/suppliers in a comparison test carried out by Practical Photography magazine in January 1992. At that time PP commented that Polycontrast III was a "fast paper with an excellent bright white base and good shadow detail". Their only criticism was that the instructions lacked colour head (enlarger) filter values. Nonetheless, they concluded "One of the best variable contrast papers here". Despite the above praise, Polycontrast III was replaced by a paper called Polymax in autumn 1992 (Ref: Practical Photography magazine, October 1992). PP's verdict on Polymax was "A great improvement over Polycontrast paper with denser blacks, whiter whites and an excellent range of mid-tones". John Culverhouse, Kodak's Strategic Product Group general manager for Professional Output, Europe, told Amateur Photographer on 17th June 2005 that production had already ended as a result of a 'dramatic' decline in demand, particularly over the (that) past year, which meant it was no longer viable for Kodak to continue making b&w paper. Mr Culverhouse said that the company expected the papers to be available for the next three to six months as stocks run down, but stressed that production of Kodak b&w film and chemistry will continue.